Download "Mt. Carmel Area School District Energy Conservation Policy Adopted 6/19/06"
1 Mt. 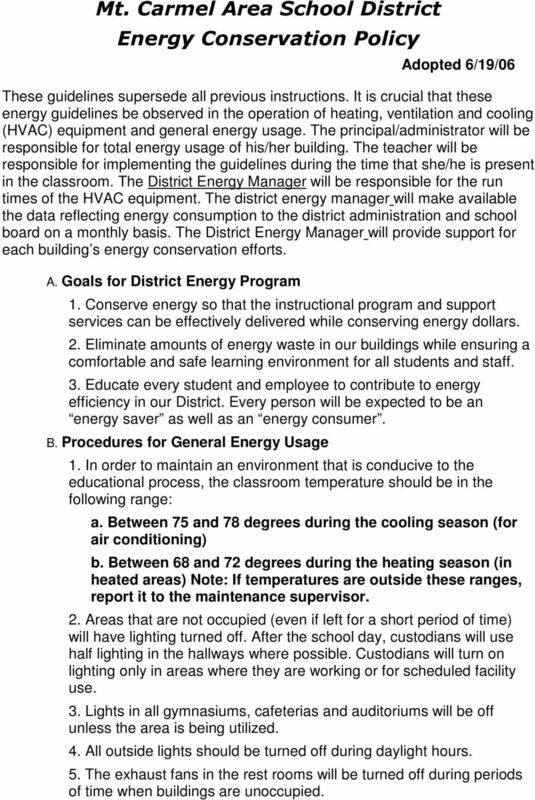 Carmel Area School District Energy Conservation Policy Adopted 6/19/06 These guidelines supersede all previous instructions. It is crucial that these energy guidelines be observed in the operation of heating, ventilation and cooling (HVAC) equipment and general energy usage. The principal/administrator will be responsible for total energy usage of his/her building. The teacher will be responsible for implementing the guidelines during the time that she/he is present in the classroom. The District Energy Manager will be responsible for the run times of the HVAC equipment. The district energy manager will make available the data reflecting energy consumption to the district administration and school board on a monthly basis. The District Energy Manager will provide support for each building s energy conservation efforts. A. Goals for District Energy Program 1. Conserve energy so that the instructional program and support services can be effectively delivered while conserving energy dollars. 2. Eliminate amounts of energy waste in our buildings while ensuring a comfortable and safe learning environment for all students and staff. 3. Educate every student and employee to contribute to energy efficiency in our District. Every person will be expected to be an energy saver as well as an energy consumer. B. Procedures for General Energy Usage 1. In order to maintain an environment that is conducive to the educational process, the classroom temperature should be in the following range: a. Between 75 and 78 degrees during the cooling season (for air conditioning) b. Between 68 and 72 degrees during the heating season (in heated areas) Note: If temperatures are outside these ranges, report it to the maintenance supervisor. 2. Areas that are not occupied (even if left for a short period of time) will have lighting turned off. After the school day, custodians will use half lighting in the hallways where possible. Custodians will turn on lighting only in areas where they are working or for scheduled facility use. 3. Lights in all gymnasiums, cafeterias and auditoriums will be off unless the area is being utilized. 4. All outside lights should be turned off during daylight hours. 5. The exhaust fans in the rest rooms will be turned off during periods of time when buildings are unoccupied. 2 6. The office staff will turn off copy machines, laminating equipment, and other office machines each night. 7. Teacher will ensure that all classroom PC monitors, local printer, and speakers are turned off during period of time the buildings are not occupied by students. Computer hard drive (CPU units) will be left on around the clock to give the Technology Department time to install software upgrades, virus protection upgrades, and conduct preventative maintenance to the hard drive (defragmentation). These units should be programmed for the energy saver mode using the power management feature. 8. Personal electrical appliances: Refrigerators (compact) are permitted in the classroom with the stipulation that during the winter, spring, and summer breaks the units are unplugged. Toaster ovens, and hot plates are not permitted in the classrooms. 10. The district energy manager will be responsible for operating the building in an unoccupied mode at the closing of each school day or scheduled facility use. 11. Any area showing signs of mold should be reported to the maintenance department immediately. C. Procedures for Operating Heating Equipment 1. The thermostat controls shall be set between 68 and 72 degrees during occupied times in the heating season. The District Energy Manager must approve exceptions in advance. 2. Individual classroom and office doors will be closed when the heating equipment is in operation. 3. In the buildings with automatic temperature controls, the start time for the heating equipment should be set as late as possible while allowing time to heat the building to guideline temperature by the beginning of class. 4. In buildings with automatic temperature controls, the temperature will be set at 55 degrees (or appropriate set back temperature based on building history) at the close of the school day or scheduled facility use. 5. The maintenance supervisor will ensure that the custodial staff checks for end-of-the-day shutdowns on Monday through Friday. 6. Domestic hot water systems will be set between 120 F or 140 F for cafeteria service (with dishwasher booster). Ensure all domestic hot water circulating pumps are off during unoccupied times. 7. During spring and fall when there is no threat of freezing, all hot water heating systems will be switched off during unoccupied times. Hot water systems will be switched off using the appropriate loop pumps. 3 8. If, on extremely cold nights, a 55 degree setback could cause coil freeze ups or not allow the building to heat to a comfortable level by the time students arrive, set the unoccupied temperature setting at 60 degrees. D. Procedures for Operating Air Conditioning Equipment 1. When the temperature is such that cooling is needed at the beginning of the school day, the start time for air conditioning equipment will be set as late as possible while still allowing time to cool the building to guideline temperature settings. 2. Thermostat controls will be set between 75 and 78 degrees when air conditioning is in operation. 3. Refrain from turning excess lights on unless needed. Remember that lights not only consume electricity, but also give off heat. This places an additional load on the air conditioning equipment and thereby increases the use of electricity necessary to cool the room. 4. 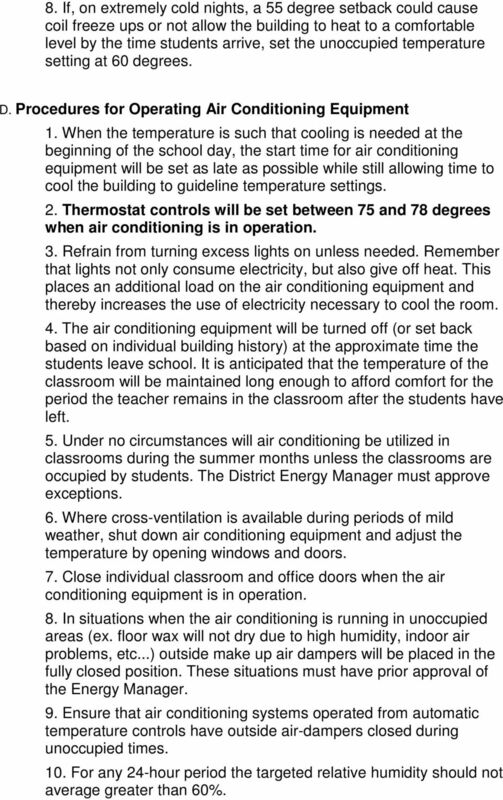 The air conditioning equipment will be turned off (or set back based on individual building history) at the approximate time the students leave school. It is anticipated that the temperature of the classroom will be maintained long enough to afford comfort for the period the teacher remains in the classroom after the students have left. 5. Under no circumstances will air conditioning be utilized in classrooms during the summer months unless the classrooms are occupied by students. The District Energy Manager must approve exceptions. 6. Where cross-ventilation is available during periods of mild weather, shut down air conditioning equipment and adjust the temperature by opening windows and doors. 7. Close individual classroom and office doors when the air conditioning equipment is in operation. 8. In situations when the air conditioning is running in unoccupied areas (ex. floor wax will not dry due to high humidity, indoor air problems, etc...) outside make up air dampers will be placed in the fully closed position. These situations must have prior approval of the Energy Manager. 9. Ensure that air conditioning systems operated from automatic temperature controls have outside air-dampers closed during unoccupied times. 10. For any 24-hour period the targeted relative humidity should not average greater than 60%. 4 E. Procedures for Water Conservation 1. Ensure that all plumbing (leaks, faucets, flush values etc.) and/or areas where water is entering the building (i.e. roof leaks, basement water intrusions) or humidity sources (condensation on pipes, sweating walls) are reported and repaired immediately. 2. All watering should be done between 5:00 am and 10:00 am. Responsibilities The principal/administrator will be responsible for the total energy usage of her/his building. 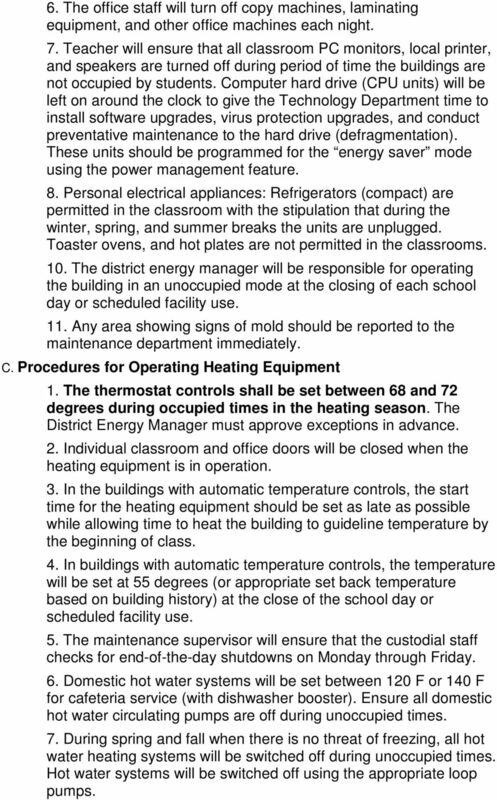 TOLLAND PUBLIC SCHOOLS Tolland, Connecticut ADMINISTRATIVE REGULATION REGARDING: Energy Conservation Guidelines Number: 2040 Administrative Approved: 11/13/02 These guidelines supersede all previous instructions. Learn ways you and your family can reduce energy consumption, cut carbon emissions, and save throughout your whole house!